Panel heaters are electric heaters which work solely by convection, heating the air that then circulates around the room. 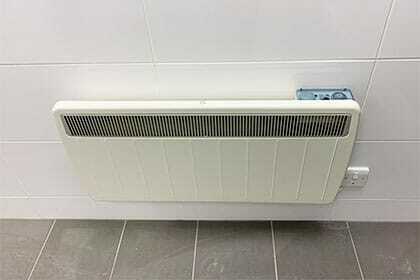 Convection panel heaters are a low-cost option for domestic properties, providing a good level of heat, quickly and when most needed. They are practical, reliable, long-lasting and come in a range of designs. Moreover, they are inexpensive to buy, install and maintain. Unlike gas heaters, they don’t need servicing or bleeding and there is no risk of carbon monoxide poisoning. In addition, they can be wall-mounted or portable providing you with maximum flexibility. If you are looking to mount your heaters, there are a few things to consider prior to installation. The various designs available give you the flexibility to mount panel heaters virtually anywhere. They can be wide, long, compact, slimline and come in a range of colours. In addition, they often have pre-cut holes to assist with fixing and drilling. It’s important to install your heaters near power sockets to avoid cabling hazards. It’s essential to check that you are not drilling into any internal power cables in the wall. Most importantly, ensure that you are not drilling into any internal pipes or cables in the wall. Also, ensure you have the correct fixtures for the wall, is it a solid or hollow wall? Overall, ensure your heaters are securely fixed to avoid accident or injury. Even if you are intending to install your own panel heaters, it is important to consult a certified electrician for advice. Qualified contractors can advise you on the best position, fixtures and ensure that you are not damaging any cables or pipes in the wall. In addition, you may want to consider hard wiring your heaters to ensure electrical safety. Furthermore, our team can ensure that your panel heaters comply with current legislation. We’ve been working with Paul Hunt Electrical for over 10 years. They have supported our business on various projects and have always delivered. We wouldn't hesitate to recommend them to any other company who is looking for electrical installation support. We found them irreplaceable and an important part of our team!